A major reason this fine painting “The Port of Chester (1863)” was created was to influence & assist the Chester City Council to understand the facility which was up for re-development. Chester in Cheshire, North West England, a port since Roman times (Chester meaning a camp or fort) represents a perfect example of a Victorian upriver port. The Port of Chester (1863) contains the important elements of commerce from that period. This painting is important as a significant piece of art of real historical worth because it faithfully shows the striking contrast between a bygone way of life, and our modern world. You can enjoy this experience as fun and fascinating, order a print or commission a painting. To acquire a print or commission a similar painting available, excellent value, you can make payments in easy stages. The old port was very derelict, scheduled for “improvements” which usually means architects and builders making a mess that last years to quick money. A decision was taken by the artist and friends to research & paint the Port of Chester as it was in its prime. Another reason was because this was the last chance to have a clear idea of how it used to appear. A perfect example of a Victorian River port during the period of the American Civil War and emphasising the seaborne aspect of the port we see the arrival of the US Schooner “May” to load Welsh silver. This painting resulted from a brief, rare, unique combination of people of good will in the right place at the right time. This complex painting was produced in 1993. Today, it simply would not be possible to research this subject so thoroughly. “Research thoroughly” is an over used term. Here you will discover for yourself this painting of the The Port of Chester (1863) is in a class of its own. I am very pleased with the picture and it will hang in a place of honour in our home”. Chester City Council took considerable interest in the development of the painting. 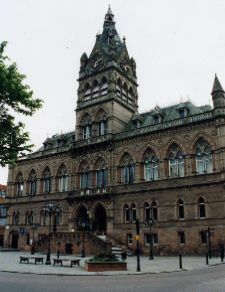 The artist was asked to give a progress presentation to the council in the town hall which he duly did including showing sketches and colour slides. The Council in turn allowed the rare honour of the city crest to appear in the margin, countersigned by the then Lord Mayor John Randall. For the unveiling of this important painting & prints Chester City Council gave a civic reception to Gordon Frickers in the town hall. At the Civic Reception, 95 framed prints sold that night to 400 invited guests. 220 prints sold in 2 weeks, why? 95 prints were sold on the first night! With more experience we would have sold at least 20 more, contact us for details. Visit our Print Gallery to order your Prints. Securely on line at this web site (visit our page Making a Payment) using the renowned Paypal, by cheque, bank draft or even old fashioned cash. The painting eventually included, 38 active figures, maybe a ghost (Salty Sam is said by some to haunt the red brick building left of centre), 7 horses (correct breeds of course), 4 swans (typical of the river Dee) and a dog being naughty on a bollard. The Port of Chester (1863) was a perfect example of a Victorian river and sea trade port as it includes about all aspects of transport at that period except a post chaise and hot air ballooning! The American schooner, the “May” was included to emphasise salt water and the international aspect of Chester’s trade. Bank, Paypal and credit card charges must be added to the final amount agreed. No picture is released before final payment. The prices on this web site supersede all previous lists. Read our Terms before ordering. Chester is a beautiful mostly medieval walled city on the river Dee and a gateway to North Wales. Chester was probably founded by the Romans. The name means camp, Fort or fortress, and has been subsequently given too many new cities worldwide probably by immigrants from Chester. You know of other Chester’s? We would like to hear from you. The city had once been a thriving sea and river port with one of the earliest canal systems in Great Britain. The site had become derelict and was due for redevelopment. A gallery, run by a freeman of the city, A.E. 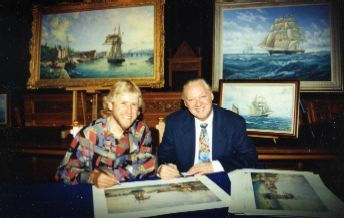 Dutton & Son, suggested making an historically accurate painting of the port in its heyday and importantly had the courage and foresight to invite Gordon Frickers to visit the location to think, to influence the re development of the Port of Chester. The suggestion was supported enthusiastically by many people in Chester and much assistance was given by local people with research. We were fortunate in particular with the chief librarian who had just retired and from members of the renowned Merseyside Model Railway Society, in particular George Winterburn and his pal Roddy. The research became very detailed. Some 12 or more A 4 pages plus sketches which today illustrations remain hidden in Gordon Frickers head and his collection! During the painting process, the city council invited Gordon Frickers to the town hall to give a 20 minute talk on the background and progress, which he duly did, illustrated with colour slides of the research and the preliminary sketches. The city Fathers considered this was to be a significant painting. 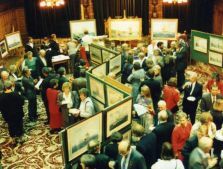 A decision was taken to unveil the new painting in the magnificent Town Hall and give the artist a Civic Reception with 400 invited guests, buffet, music and wines. Permission was given to allow the privilege of the city coat of arms in the margin of the proposed prints and for the Mayor John Randall to co sign the published edition. The artist generously agreed to a donation from each print to go to the local Sea Scout organisation. Several local businesses still trading at the time had their origins pre 1863, the Chester Chronicle being one and they are represented in the painting. They in turn generously sponsored the Civic Reception. 400 invited guests had an opportunity to meet the artist, his family, the mayor and councillors’ and some of the researchers, plus see an exhibition of other prints and original paintings by Gordon Frickers. The guests also saw examples of the new print and news clippings about the artist as well as enjoy socialising at an excellent bar and buffet. The Council also requested a booklet be published with the story of the painting; unfortunately time and cost conspired against this. 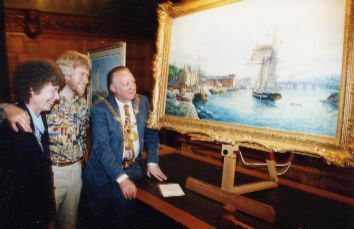 Despite modest price for 1993 of £10,000 and the efforts of the gallery, the original The Port of Chester (1863) painting was not purchased by the city, city museum or any local person, eventually going to a millionaire businessman in Plymouth were it remains to this day, the pride of his collection. The central feature of our painting was built in 1735/6 as part of a major improvement scheme. The two warehouses on the left of the picture have largely remained unchanged since 1863. Today one still retains most of its original features, the canopies over the loading bays and the window frames are examples. The other has been seriously defaced but is still recognizable and could be restored. Other buildings shown include the forge and the House of Industry. This well proportioned building, also known as the “Union Workhouse“, is illustrated on a number of etchings. By 1874 it apparently had a number of additions built against it, the survey of that year does not give a clear picture. It was still standing then against River Lane by which time the first two gas tanks were in place. The 1874 survey clearly shows three cranes on the wharf. Use of the wharf probably peaked when the railway company built new wharfs down river at Saltney. Connah’s Quay (probably named after an Irish merchant) also developed with the railway impetus. Behind the port one catches a glimpse of the City Walls which date back to the power of Roman assertion of A.D. 61 and are two miles long. Rebuilt by the daughter of Alfred the Great and again many times since. By 1863 the Cathedral Tower dominated the Chester skyline. The most noticeable change to it since 1863 is that the 4 turrets have ‘grown’. The original building was a Saxon Church, perhaps as early as 660 A.D., which became a Benedictine Monastery in 1092. It became a Cathedral in 1541 after Henry VIII dissolved the monasteries. Also standing over the site is an old “Water Tower”, built on an extension from the wall in 1322 for £100 by freemason Helpstone, after the river had changed its course. To commission a similar painting available, excellent value, you can make payments in easy stages. Whilst it was tempting to show a locally built ship, we decided on an American schooner to emphasis the international importance of the old port. At this period and well into the 20th century small schooners regularly braved the Atlantic and the North Sea, summer and winter. With a crew as few as six they could typical be bound anywhere from Canada to Turkey, Brazil to Russia. If clippers were the oceans’ racehorses, these were the tough ponies. Many were notably fast and one, the “Kathleen and May” built at Connah’s Quay in 1900, survives for many years as a museum ship, first at The Barbican, Plymouth, later almost completely hidden from view, near “H.M.S. Belfast“, Tower Bridge, London. Kathleen and May is today lying at Barnstable, much restored and can be seen from the old Barnstable Bridge or the quays. By 1863, schooners were requiring smaller crews and increasingly refined hulls and rigs. They were becoming more economic to operate than ships, barques and brigs, and so were a design in the ascendancy. They were more maneuverable in confined waters, went towards the wind better and were easier on their gear than their more heavily rigged sisters. They were arguably not as quick but, size for size, carried as much. At this time, American and European Atlantic seamen continued to call them schooners. The American type discarded square topsails, tended to have three (and later up to seven masts) all identical height and layout, with clipper style bows and square counter sterns. As we felt square sails emphasized the deep water aspect of the vessels and the port, we chose “May“, built Essex, Massachusetts, in 1833 at 126 tons. She would have been old by 1863, which explains her appearance, colonial as opposed to American style. She still retained square sails, even setting studding sails (note booms on the main yard) and has quite a full hull shape. Yet to the knowing eye, there is about her evidence of the beginnings of the change, hard to spot in the organized chaos on deck as she edges to moor up. The silver she was about to add to her cargo would have been all the more vital to her people as the American civil war had started in 1861. We see the “May” making her final approach to New Crane Wharf on which a party, escorts, and Lowes’ silversmith wagon await. One of the May‘s crew is throwing a monkey’s fist and line to a local dinghy, which will take it ashore to warp the schooner to the berth. The master, at the helm, has ordered the topsail backed, we see it partly braced round and beginning to shiver, to stall her way in the current, the rudder is going over as he delicately balances the forces of light breeze, current and the vessel’s way to bring her gently to the wharf side. A dinghy has been towed upriver for the same reason. Anchors are kept ready, just in case the currents take charge. Other crew stand by mooring lines, or are busy striking sail, hanging fenders, and generally preparing to make fast. A complex, tricky maneuver which now would likely earn applause and probably the attention of the local press and t.v., but was then routine. All these tasks are so accurately shown because Gordon Frickers has sailed on schooners and also what was until her tragic loss, the last 19th century merchant brig “Maria Asumpta“. The schooner “May” would indubitably have been flying a U.S. flag. The question was which one? The first continental navy ships in 1775, a year before the declaration of independence carried six red and seven white stripes for the thirteen colonies. Over them wriggled a yellow snake with a long forked tongue and fangs. Beneath it ran the slogan “Don’t Tread On Me” (derived from the Latin “Nemo me impune laccessit“, which translates “nobody bothers me with impunity“). English ships had been flying striped ensigns since at least Tudor times, but the design was hardly an original English idea. It is known though, that in 1596, “Lion” and “Dreadnought” wore red-white-blue seven striped ensigns, with the St.
Ironically the first time a U.S. ship was formerly saluted (by the Dutch) it was flying a Union Jack. Originally the stripes were flown with Union colours, in a style similar to the red ensign. This was altered in 1777 to a blue field with thirteen stars in a circle or three rows. The flag of 1818 even had the stars arranged as a five point star. The number of stars grew as states were added, twenty by 1818, thirty-four by 1861. Smaller vessels often retained the original thirteen stars up to 1916. Merchant ships were usually carefree about exact dimensions, as well as layout so an old style flag was quite likely. The river had been an important source of transport and shipbuilding since earliest times. By 1863 many improvements to depth, flow and wharfs had been made, despite opposition from amongst others, the emerging Port of Liverpool. The river was buoyed and dredged to 18ft. It is a popular misconception that the Port of Chester declined long ago. Rather ports like Liverpool expanded out of all recognition. There was still a thriving coaster and schooner trade up to World War one and Chester like most small ports had its share. In 1863 outward tonnage was about 150,000 and included such diverse cargoes as grain, slate, cheese (mostly to London), silver, timber, machine parts, coal, bricks, salt, lead, etc. The Chester Canal, with locks, was capable of taking wide river barges as well as the narrow boats. The Chester Canal, built in 1776, was one of the earliest in Britain, later connecting to the Grand Trunk Network. It was still (just) possible in 1993 to take a narrow boat onto the Dee, up beyond the Groves or down river to Connah’s Quay via the New Crane Lock. The painting shows a variety of barges. Three are narrow boats, the general cargo type with cramped living quarters aft and occasionally for’ard. Narrow boat sizes vary considerably, but the object was to minimise canal construction costs so 72ft by 6ft launches may be considered typical. The Chester canal built 1772-9 predates their design and has locks 14ft 3inches suitable for “dumb butties” and coastal barges then already in use. Narrow boats carried about 30 tons and competed against horse drawn transport. By the 1840’s they were being rapidly eclipsed by railways. Early narrow boats were wooden. These simple craft were steadily refined. Two types of stern are shown in the painting, the more “V” shaped being newer. Similarly there is a clear improvement shown in the two rudders. In 1805, the canal was extended to Ellesmere Port enabling wide barges to circumnavigate the Wirral Peninsula should they so wish, or avoid an open sea passage. The painting also shows a typical narrowboat horse being unhitched and fed, recognize the breed? Wide barges by 1863 had a wide variety of modus operandie. Some sailed with a single square mainsail and a single stay sail, a few even had lee boards. Most used current, tide and barge-poles. Dee-built vessels tended to favour rounded ‘counter’ sterns and had large hatchways suggesting they were only sometimes used as coastal craft. Certainly, the district developed its own distinctive styles of sea going vessels, favouring small ketches like the “Little Pet” seen economising by ignoring the crane for which a fee would be required and loading with her own gear. “Little Pet” shows a deep solid hull for maximum cargo rather like the River Severn Trows. She would have required considerable skill to handle efficiently but have been strong enough to handle much abuse. The painting clearly shows two small wooden vessels in frame, one in the first stages of being planked up, work with which your Artist is very familiar, having himself worked as a trained shipwright. With extensive forests in the hinterland, ships will almost certainly have been built at Chester since at least the Roman times. One of the sites most favoured by the shipwrights is the area from the viaduct, North. Slips ways and sawpits could easily and cheaply be built besides relatively deep tidal water and there was a plentiful supply of timber, metals and coal. Chester built ships were usually between 50 and 500 tons, that is small barges, fishing boats to medium sized sailing vessels capable of ocean voyaging. 450 ships big enough to warrant registering are known to have been built on these sites from the 18th century. Until the expansion of Birkenhead with the coming of the iron and steel ships, the Dee probably saw more new building than the Mersey. Many of these vessels were registered at Chester and crewed by local men. Others were for merchants from at least as far away as London. Even the Royal Navy ordered Chester Ships. The Chester built sixth rate “HMS Levant” fought “U.S.S. Constitution” in 1815. “Levant” in protecting her convoy reputedly put up one of the fiercest fights of the war of 1812. By our painting’s date of 1863, there had been considerable technical innovation at the site. Sandycroft ironworks probably on the site later used as a gas works had built at least 3 paddle steamers one of which was “Zephyr“. We don’t know for certain if the paddler shown was “Zephyr“. We do know from period lithographs that the vessel was sailing the Dee and that it is probable she was “Zephyr“. From 1857 to 1869 Cox & Miller of Liverpool used the Sandycroft yard to build iron and composite ships up to 1366 tons. The bigger vessels were side launched. Some had engines, some went on to become noted fast sailors. Our date of 1863 would have seen the site close to the peak of its activity. By 1870 the gas-works were in place, a slump and various misfortunes including a fire, caused by railway engine sparks, had sapped the shipwright’s strength. In those days most ships and many businesses were owned locally. Risks were spread by owning 64 th’s and by insurance (mutual protection clubs) however the increasing importance of Birkenhead gradually eclipsed the Chester shipbuilders. The painting mentions a number of businesses by name. Capt John Peter Davis is known to have operated a sail loft and chandlery. A.E. Dutton were still trading in Frodsham Street 130 years later, though soon to dissolve in a scandal which included ripping off Gordon Frickers! Quellyn Roberts (wine merchants) happily still with us, were at 15 Watergate Street and it was their Pusser’s Navy Rum that was part of the inspiration behind the conception of this painting. Fittingly, John Randall‘s name also appears. Lowes, the Jewlers’ and silversmith, then had extensive interests in mining including silver and still operate as Chester silversmiths. The bridge or rather bridges, present though old and in a poor state of repair, when Gordon Frickers was on site are likely to be partially demolished and are certainly not original. There have been numerous alterations and complete rebuilds since the first railway bridge. No lesser person than the famous Robert Stevenson (of the engine “Rocket” fame) designed and built the original bridge and viaduct which represented a considerable engineering task. Even by today’s standards, just making the viaduct bricks would be a very valuable contract. In the context of the painting, it was thought essential to find a viewpoint to include this structure because after the city walls it is probably the largest single building. For our period it represented emerging “new” technology, a major transport theme and an important link between the city and changing trade patterns as the Industrial Revolution gathered impetus. It naturally followed that having chosen to show a view looking south; we would want to place a train on the northern of then twin tracks. We soon discovered that would mean a train, Chester bound from Holyhead. The Merseyside Model Railway Society became the primary research facility, an introduction being made by senior member Mr George Winterburn, to Mr Rodney James, the society librarian. The club has 32 rooms and with over 200 members is one of the foremost in Britain. Fortunately one of the members, Mr. H.D. Goodwin is an expert on the line, a Chester resident and former city librarian. Immediately appreciating the proposed vision, he was quickly able to supply much information and point to additional sources of material. The background story rapidly emerged in surprising detail. Opened in 1846,’ Designed by Robert Stephenson, son of the famous George. It originally consisted of stone piers with 3 x 98 ft carrying spans made of cast iron girders. Then, it was the longest cast iron girder bridge in the world. The old railway bridge was the property of the Chester & Holyhead Railway, leased to the Chester & Shrewsbury Company. At the site of the bridge the river was 250 ft wide, depth at low water 9 ft, high water 21 ft, the track being 25 ft above high water. On 24 May 1847 the 18:15 train from Chester was wrecked when a span collapsed. As a result of this accident the bridge was further reinforced, the ‘V’ struts which show underneath as clearly as in our painting. The bridge continued to serve until 1870 when it was replaced. C.&H.R. was vested in the L.N.W.R 1858 hence the livery of our coaches. We had a long and detailed discussion on this topic. It is known that L.N.W.R. used only 1st and 2nd class on their Chester – Holyhead express, and that 2 brake vans were usual for six coaches, engine brakes being only wood blocks at the that time. The Merseyside Model Railway Society begins to understand the original colour schemes. The livery was white “spilt” and a reddish colour variously described as purple lake, plum dark claret or carmine lake. Paint in that colour now is usually called red. Members of The Merseyside Model Railway Society had for years been puzzled by the colour schemes as surviving black and white photos suggested many variations. As an expert on colour and paint Gordon Frickers was able to enlighten them. The original recipe exists but mixes must have varied with temperature etc. Also the appearance would be modified by time, viewing distance and prevailing light. In short we don’t exactly know because there was not an exact colour and the natural copal based paints were more susceptible to aging than modern synthetic paints. We do know though, the scheme was very smart and neat with gold lettering and crests on doors and yellow ochre trim. Window frames were varnished and oil lamps fitted in the roofs. The coaches varied, tending to become larger with each new batch built. Our period shows a typical mix of sizes of 4 wheeled coaches, the different builds being most easily distinguished by their window layout. The express trains carried Post Office mails. From as early as May 1848 drivers reached speeds of 45 mph and they were considered reckless, being warned “that if they persisted they would be taken before a magistrate“. Time keeping was considered vague. ‘The Illustrated London News’ commented “This cannot fail to prove a great inconvenience to travellers.” Even the Admiralty tried to help with special pocket watches. The engine we show earned her reputation as a flyer in the 1860’s hauling from Euston to Holyhead. The modest P.O. speed demanded was considered rather splendid at the time. The mail trains became known as the “Wild Irish Men” although many other regions had faster engines. The idea behind the L.N.W.R engines was just enough power, no excess, maximum economy. The first engine of the class was called ‘Problem‘, not in today’s sense of the word but in the mathematical sense. Another engine was called ‘Theorem‘. No 229 “Watt” first put the class in the limelight on Jan 9th 1862, by averaging 54.5 mph for 103.75 miles. However, in the view of the autocratic chairman, Sir Richard Moon, 40 mph was quite enough for an express. He even repeatedly tried to have the P.O. reduce the contracted speeds. With such a policy, designer John Ramsbottom aimed for cheap to construct, economical to run. The original engines had no brakes or cab, but an ornamental chimney cap! In 1863 they were in green livery with black lining. The most famous of the class is shown crossing our bridge. She can be identified by the famous bronze medal won at the 1862 International Exhibition, fastened above her number (531). She is “Lady of the Lake” and eventually the class was known by her name. With various rebuilding, the class continued to serve until 1903-7 by when they were not so much worn out as too small for increasingly large trains.